Designed To The Nines | From Worst to First! You are here: Home / blog / From Worst to First! I am really excited to share this project with you. As the title suggests this room really has a dramatic transformation. You had a bit of a sneak peak with my art project, but the overall room is a little unexpected. It’s definitely not your typical powder room… and I LOVE that! The years of baked on filth and neglect are as old as the house in this room (about 17). Every time I went in this room it made my skin crawl and I didn’t realize how bad until I completed this transformation. After a good deep clean and steam clean on the floors, I was ready to go. As you can see it has the typical builder grade oak cabinet… which is what is through out my whole house. I have a series of transformations planned on all of them, because builder grade golden oak does not scream “Designed to the Nines” to me. It will hopefully give you some ideas to upgrade your own existing cabinets. The budget was under $100 for the whole room and I came under budget!! But we’ll get back to that later. I was lucky enough to start out with a small chair rail molding and decided to add some textural beadboard wallpaper. I paid $32 for my roll from a wallpaper store in our area and then not even 2 days after installing it, found it at Lowe’s for $20! Serves me right for not doing my homework… but now I know where to get more, as I will definitely use it again, because I lurve it!! I remember not too long ago the beadboard wallpapers of yester years weren’t that great. But the new stuff is extremely convincing of the real stuff, however, it is not as durable obviously. The wallpaper you will want to get is in Lowe’s in stock section made by Allen + Roth. Then, I decided to break several “rules” by adding horizontal stripes above above the vertical “striped” beadboard. I could have gone a little more subtle… but that wouldn’t really be me. I went with a dark chocolate and the original cream wall color. Go here for my wall striping tutorial. Then I added a surprise wall of turquoise. I have a mini tutorial coming up on the green vanity coming in the next few days, so I’ll save that and a few other things for another day. I painted a silver mirror I have had for a couple years and hadn’t used yet (paid $7 on a sidewalk sale). You already got the DIY vintage art tutorial. There are a few more little accessories I need to get… orange tulips, a whimsical mushroom… just a couple finishing touches for my quirky bathroom. In the end, I couldn’t be more pleased!! I smile every time I go in this room. To my surprise my husband loves it too. I think while the room was in progress he thought I was a little nuts. A Fresh, Clean, Wonderful Powder Room: Priceless. Wow! It looks sooooo cool! You are so talented!!!! LOVE IT, Love it and love it some more! You are awesome, Natalee!! Do darling. I wish I were brave enough to be as daring as you are in design! love ya! NataLee! I love the stripes. Turned out so fun. I would never have thought of that color combo but it works so well together. Awesome! Hey NataLee! It was fun finally meeting you the other night at Relief Society. Love the bathroom! I just stumbled upon your blog, and do love it. I am using the Allen + Roth beadboard wallpaper right now. I just put it on tonight in our guest bathroom. I am wondering though, are your walls textured and did any of the texture show through? Ours is a textured in a way that there is a few lines showing through on certain parts of the paper. Congrats on baby as well and happy decorating! Thanks Alisha! We love you back! Wallpaper (by nature) isn’t going to hide everything, darn it! Yes, after I first applied it to my walls I did notice the texture showing through. However, the more the paper dried and recovered from being adhered to the wall, the more it puffed back out and you don’t notice it near as much. I am loving my beadboard wallpaper. I hope you are loving yours too! Thanks! I will be sure to stop by. Feel free to enter our giveaway for a set of three purdy paint brushes too! Wow, nice job! I contemplated stripes on my bathroom that I just finished yesterday, did you almost go insane doing the stripes? 😉 I like the bathroom vanity in green, something different. 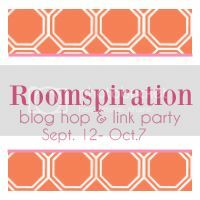 Come check out my bathroom and there is a link for our blog party where you could link up your bathroom! I’m loving every bit of it! It’s fabo! Come check me out when you get a chance. I am absolutely crazy about this bathroom! What I like so much about it is that it started out as the bathroom everybody has! Thanks for the supply list too! Saw you on Feathered Nest. I’m so glad you like it! Thanks for stopping by! looks GreaT! 🙂 I have a small 3/4 bath that I want to dress up. Thanks for sharing your out of the box ideas. I am in the middle of getting ready to do a huge designer hoard/yard sale right now, but I’ll try to get a picture of the label for you to take to the home depot to give them if you’d like. But I LOVE the color and have not regretted painting it such a bold Kermit the Frog type green. Thanks for stopping by!